Blog – What The Craft! Here at WTC HQ, we’re working on an english paper pieced quilt. This labour of love is entirely hand stitched and working on it happens during baby naps and between working on WTC workshops so going is a bit slow. However, we love working on it and would like to keep you updated on the progress. So far, we’ve worked cutting some hexies and have started to sew together some motifs which will be joined to create the top of the quilt. We love making flowers here at WTC, both tissue paper and crepe paper flowers have long been favourites but we also love felt flowers. Felt has a great texture and allows you to pick any colours and sizes for your flowers. Make a great bouquet, decorations, flower crown, centre pieces or corsages for your big day with your friends and family on your hen party. On your big day, you will all be able to pick out the flowers you made and your guests will love seeing them in place in your bouquet or decorating the venue. As the felt will last forever, you can keep your flowers as a keepsake from your wedding or give them to guests as gifts on the day. To book a workshop or to get in touch about commissioning some felt flowers from us, just fill in the form below and we’ll be in touch ASAP. We made a selection of placemats and mug rugs recently. Using a selection of ribbons, lace, buttons and applique we personalised each item. They would make a lovely addition to a dinner party or for your wedding party. Tailor the fabric to your wedding scheme or use the tartans of the bride and groom to create new pieces, bringing together the two families. Get in touch to book a workshop or commission some pieces. Crepe paper flowers offer you a load of options when creating your wedding flowers. You can have any colour combinations you like and make your blooms as big or as small as you want. Use crepe paper flowers for your bouquet, button holes, centrepieces or decorations. Crepe paper flowers are long lasting and can be kept for years as a souvenir from your wedding day or given to guests as gifts from your day. We can make flowers for you or you could book a workshop as part of your hen party. Just get in touch and we can tailor the event to your tastes and the colour scheme of the wedding. We love paper flowers here at WTC. They’re are lovely addition to your wedding or your home. Whether you pick card, paper, crepe or tissue paper you can make some beautiful flowers in our workshops. Use your flowers for bouquets, posies, flower crowns, buttonieres, whatever takes your fancy! We’d love to run a workshop for your friends or hen party. Get in touch and we can arrange everything to suit your theme and tastes. 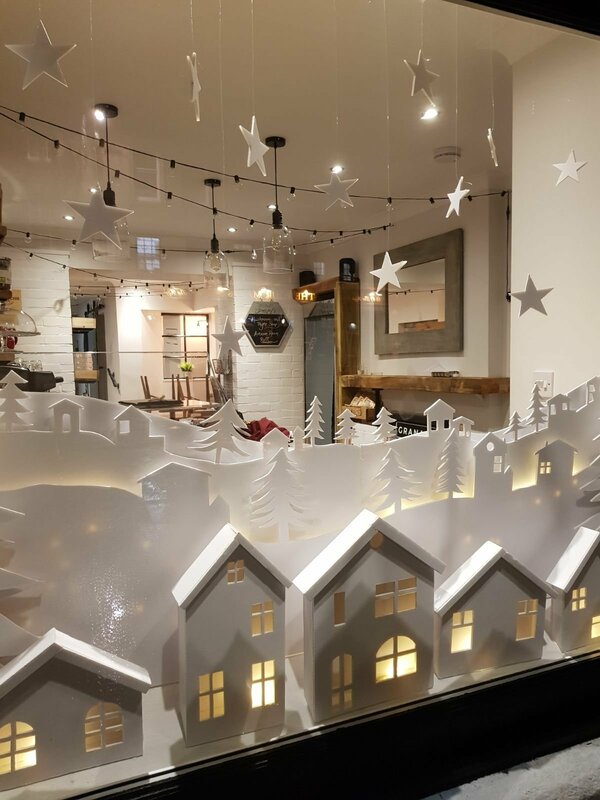 Our Jenny has been working really hard to design and make the Christmas window for the Granary Cafe in Linlithgow. 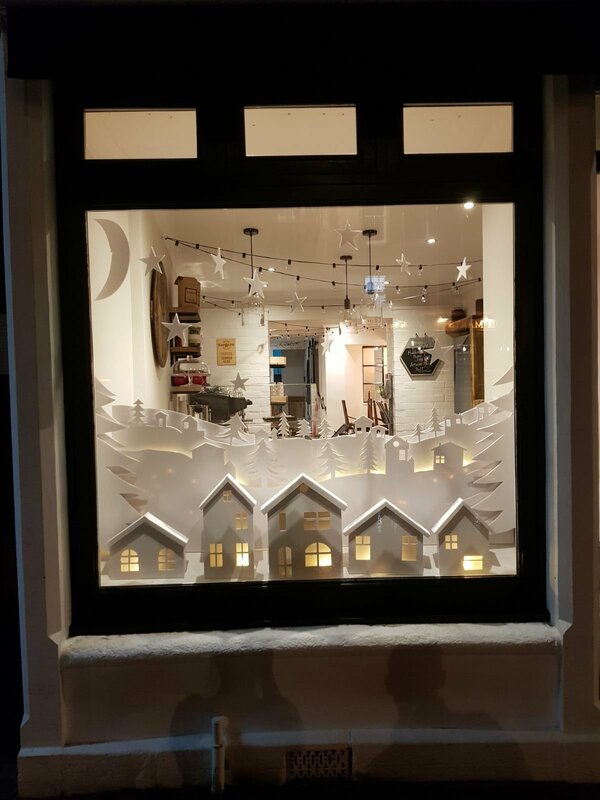 It’s a beautiful winter wonderland display. The Granary is one of our favourite cafes so if you’re ever in Linlithgow pop in for a bite and a coffee. Your wedding stationary is a great way to express your personality and let your guests know what to expect on your big day. You can get your hens involved in creating some stationary. From invitations to place cards, quilling is an accessible papercraft technique which allows you to add colour and texture to your invitations. If you’re interested in this workshop or would like more information on any of our workshops, please get in touch. The beauty of felt is it’s versatility. In our garlands workshops you can be as creative as you like. Felt can be glued, sewn, layered and embellished to create a truly unique decoration. We can tailor the materials to your colour scheme or wedding theme to ensure what you create truly reflects your personality. If you’d like more information about any of our workshops, please don’t hesitate to get in touch using the contact form below.